Some of the Islamic Republic's lies are not just outrageous, they are damn silly and stupid. Websites and publications like Kayhan, Fars News (aka False News), Young Journalists Club (YJC) and so on, are so discredited amongst the vast majority of Iranians, that no one would think twice about believing their so-called news. Islamic Republic however, has found a new platform to give credibility to its unconvincing lies recently. It is the CNN iReporter's website. Anyone can go and post any defamatory falsehood on CNN's iReporter site and CNN makes no effort to vet or verify the posts. Once the purely fabricated story gets published on CNN's iReporter, then the credibility of a major US news agency rubs off, even on the most unlikely report. Many people seem to think the iReporter page is somehow creditworthy news and thus the old saying "If you throw enough mud at someone, eventually some of it will stick" manifests itself on CNN's unverified iReporter pages. The Islamic Republic's defamatory propaganda has recently been targeting the presenters on the popular Iranian satellite television channel, Manoto TV. The depressing drab IR state TV, unable to compete with the popular Iranian satellite TV station, broadcast from London, has resorted to portray the TV's presenters as immoral degenerates who will set a bad example to the youth of Iran. 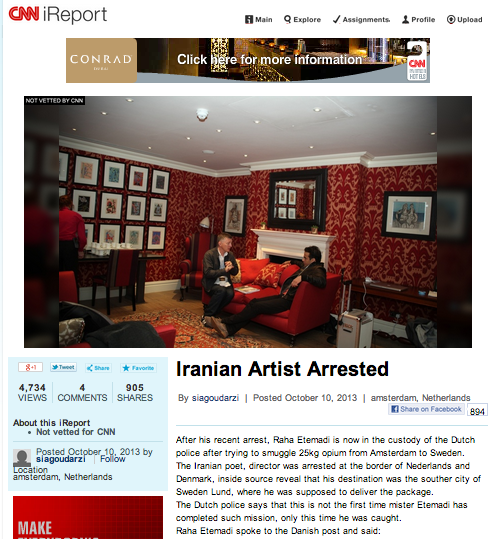 An average reader with a reasonable number of brain cells may soon realise something fishy about the story posted on CNN's iReporter site, by reading Raha Etemadi was arrested on the "border of Netherlands and Denmark"! but it seems CNN is happy to once again be of service to the Islamic Republic. One again the IRI taking advantage of lazy reporting and the fact most media stations treat them with kid gloves due to the paid off infiltration of it's Lobbyist's and Apologists! Most can't see these smug sly agents working under their very noses... If anything, it's these Khamenei stooges laughing up their sleeves far away from oppressive Iran who lead the most cosy and immoral degenerate lives in the likes of Canada, the US or London. pot kin jan, the CNN reporter reza sayah is already working on behalf of the regime….